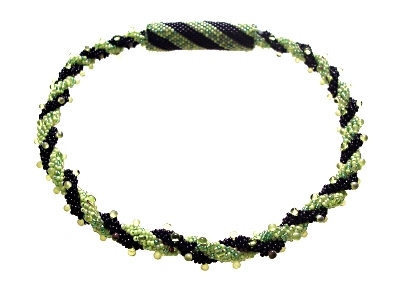 This necklace was beaded using double spiral rope in a mix of beads which included seed beads and drops. Its clasp is hidden underneath a small piece of tubular peyote stitch which can be worn at the front or the back. This technique is taught in my Spiral Rope Class.